We offer a complete selection of batteries. 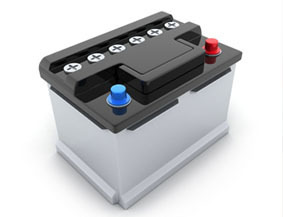 Not only batteries for auto and truck, but also marine, ATV and lawn/garden batteries. The performance of the engine, alternator and secondary electrical systems depend on the battery. New battery service includes replacement, proper disposal of the existing battery and removal of corrosion from battery cable terminals. This will help your battery provide dependable starting power, along with the power to run all lighting, power seats, windows and radio. When should I have my battery checked or replaced?